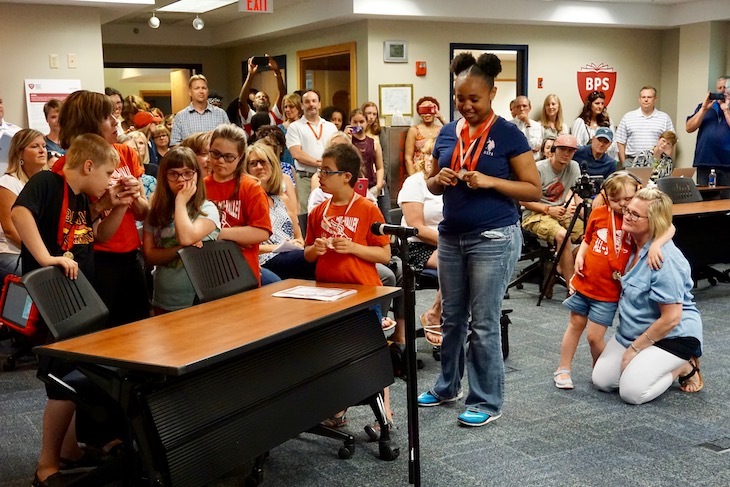 The following is a brief recap of the Tues., June 20, 2017, BPS101 Regular Board Meeting. View the agenda and all supporting documents from this meeting and minutes from previous meetings. View BATV’s recordings of previous meetings. 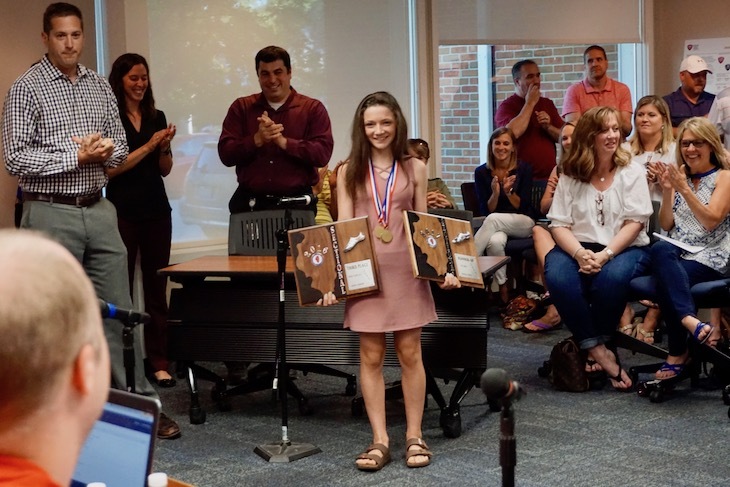 Incoming Rotolo Middle School 8th grader Katrina Schlenker was honored for her 1st-place finish at both the Illinois Elementary School Association (IESA) state Cross Country meet and IESA state 800 and 1600 Track & Field events. According to RMS Principal Bryan Zwemke, only a handful of Illinois students athletes have ever achieved this double championship, and it’s a first for Rotolo Middle School. Running runs in the Schlenker family! Katrina’s older sister, Sabrina, who is going to be a sophomore at Batavia High School, was on the BHS Girls Track & Field IHSA State Team her freshman year. At sectionals, her 4 x 200 relay team took first place, her 4 x 100 relay team took 2nd place, and she came in fourth for the 300 meter hurdles. Congratulations to Katrina and Sabrina! 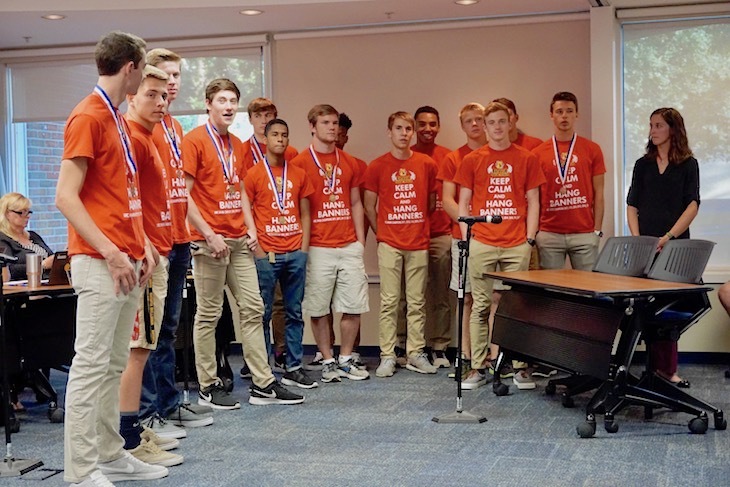 The Batavia High School Boys Track & Field Team was honored at the Board Meeting for outstanding achievements throughout this year’s BHS Track & Field season (undefeated) and at the IHSA state meet (eight medalists earned 11 medals). BHS Track & Field Head Coach Dennis Piron shared highlights from the season and his pride for the team. It was a terrific celebration of our students! Application 101-17-01 – Walking along Pine St from Hart Rd. to Prairie St. and Crossing at Hart Rd. and Pine St. Application 101-17-02 – Walking along the east side of Woodland Hills Rd. including the roads east to Kirk Rd. from Pine St. to Wilson St.
Board Members approved the 2017-2018 student handbooks as presented on the District website. The Board voted 7:0 to approve a guaranteed energy savings contract for lighting with Performance Services Inc. in the total amount of $1,520,532. The final scope of the project was determined primarily by payback—the estimate of the number of years it would take the annual cost savings to recoup the project cost. The Board unanimously authorized the submittal of a continuing application for the Alternative Learning Opportunities Program (ALOP) for the 2017-2018 school year in partnership with the Kane County Regional Office of Education. This program launched at Batavia High in the 2016-17 school year with much success. The continuing application opens the possibility of expanding it to Rotolo Middle School, allowing the District to better support the most at-risk students through a personalized learning plan and environment that includes social and emotional support. “In examining our current ALOP, we saw a need to begin this form of personalization at the middle school level,” said BPS101 Chief Academic Officer Dr. Brad Newkirk. If the application is approved by the Illinois State Board of Education, the Board will have the opportunity to vote at a future meeting on the addition of staff at RMS to support this program. Board Members confirmed their support of the District processes in place for staffing allocation and class-size issues. No action was taken on—or is planned for—additional sections or multi-grade supports. Tues., August 8, 7 p.m.
Tues., August 22, 7 p.m.